Big Eyes will probably be the last film I review for the year. I know that there are more films that I should probably see, but I’m pretty tired. Luckily, I ended my year on a good note with the new film from director Tim Burton. Burton has set aside ruining a franchise to tell a very personal and endearing story of Margaret Keane. It’s a film that’s been on my radar for awhile now due to the talent both in front and behind the camera. Burton directs a script by Scott Alexander and Larry Karaszewski, who wrote the screenplay to Ed Wood, my favorite Tim Burton film and one of my favorite films in general. Also, the films two leads are played by Amy Adams and Christoph Waltz, two actors that are both very esteemed in their own respects. Here’s my review of Big Eyes. The film tells the true story of Margaret Keane, whose played by Adams. We first see Margaret leaving for San Francisco with her daughter as she tries to find herself in the city. She also is a painter with lots of potential. She meets Walter, another aspiring painter played by Waltz, and both begin to strike it off. They are immediately married and they try to get Margaret’s career running off. Walter discovers that her paintings sell more than his paintings, and so he begins a scheme in which he takes credit for the paintings, which are all of these big eyed children that Margaret has modeled after her own daughter. The real story of the tension between husband and wife lasted decades, but in this film is about a decade or so. This is a very fascinating story just on its own, as many wonder why Margaret would’ve gone on with a lie like this. It’s a very fascinating character study to watch on screen, and Amy Adams portrays Margaret beautifully in this true story of a film. It’s some of Adams best work in a career with never-ending great work. This is also the best film Tim Burton has made in years, since his 2003 film Big Fish. It’s nice that Burton has taken a break from doing the big studio crap to do a tiny film like this. It’s not the best movie of the year, but its a very solid and inspiring biopic of one of the great American painters who inspired countless people and artists. 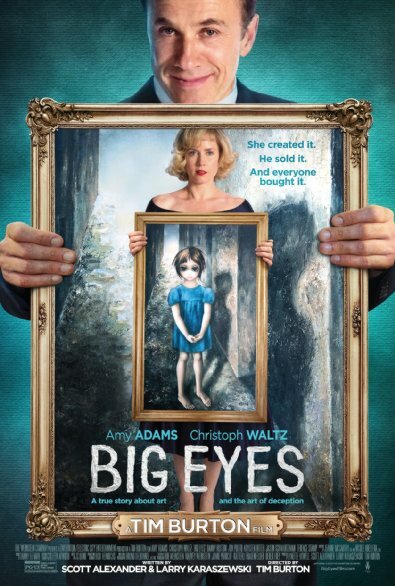 The film does have its share of flaws, even if the film is under two hours, but Big Eyes is still a solid film that will hopefully get Adams some awards attention for this role. Christoph Waltz also does some great work here as Walter, as Waltz’s intensity as an actor is on full display here once he starts to realize that he can’t control Margaret like he use to. Its a great role for Waltz to play, with Burton and company going to great lengths to make the audience really despise the character and the man himself. Jason Schwartzman plays a tiny role of an owner of an art gallery that is across the street from Walter’s gallery. I wasn’t crazy about the role because I think Schwartzman is a talented character, and instead he feels like another Wes Anderson creation. I just hope that Schwartzman doesn’t get as type-casted as he usually does. Krysten Ritter plays a friend of Margaret’s in the film, and she does some good work here. Ritter is another actress whose about to break onto the scene in a huge way next year with being cast as the lead in a Marvel television series exclusive to Netflix. The great Terrence Stamp makes a fun little appearance in the film as a critic of Keane’s, with both men despising another. The film was pretty entertaining and interesting for the most part, but I really started to dig the film toward the end of the second act and beginning of the third act. This was the period in Margaret’s life when she left Walter and took her and her kid to Hawaii, and where she went to court with Walter to prove that she was the artist behind the big eye paintings. This part of the movie was very well done, and the courtroom sequence was fun and exciting. I also admire Burton for being very restrained with this film. Usually when filmmakers as quirky as Burton put out restrained films like this, the product feels bland and tasteless. This is not the case with Big Eyes, as Burton being restrained was the reason why I enjoyed Big Eyes. I wish Burton would continue to put out more character-centric stories such as this. To sum it up, I enjoyed Big Eyes. The film does have a few problems, but for the most part its a well made and well crafted story, with terrific performances by Amy Adams and Christoph Waltz. The best actress race is always a crowded race, so hopefully Adams will be able to breakthrough with this great performance that she’s turned in. As I said, this is my last review before I go to work on my top ten. Expect to see that list sometime this weekend. December 27, 2014 in 2014 Film Reviews, Movie Reviews.